BirthDay Numerology | Which Day were you Born ? Every individual on this earth was born only in 7 days ! Do I sound funny? May be ,but I am 100% correct ,because the whole population in the world was born in 7 days of the week(Sunday---to----Saturday) . As I always say "waqt ka har shay gulaam", " Time rules every person" . There must have been a birth - day on which you were born .Your birth day tells a lot about your character &destiny. 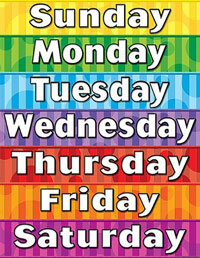 Every day of the week is ruled by one of the planets . The day is greatly influenced by the ruling planet , as a result the people born on that day are also influenced by the planet. Sunday Born :Sunday is ruled by SUN. It makes the person, born on this day ,creative and inventive in his work . They are very strongly individualistic and often seen to function above the herd. He has very definite views in his life. He hates to be restricted in any way . He has a strong will power and is very independent in thoughts . If the date of birth is 1st , 19th or 28th then sun becomes very strong .They speak very frankly . They generally suffer from acidity . Monday Born : Monday is ruled by MOON . A person born on this day is idealistic and imaginative . They have a round face an often suffer from cold and cough .He can plan very well , but often fail to convert his plan into physical action very well . They are always busy and are very laborious. They often lack confidence and are constantly in conflict within their own minds. Moon is deemed strong if birth is on 2nd , 11th , 20th or 29th . Tuesday Born : Tuesday is ruled by MARS . Influenced by Mars they are extremely determined .They dominate their subordinates and colleagues. They are very courageous and fight till the very end. They meet with accidents frequently and are often found injured and wounded. They generally have domestic strife in their life. They hate to be pointed out for their faults. They create magnificent things if they are given full control. They have the ability to fight against extreme adversities. Mars is deemed strong if birth date is 9th, 18th or 27th of any month. Wednesday Born : This day is ruled by MERCURY. People born on this day are diplomatic and tactful. The great end of their life is not knowledge but action. They have immense physical as well as mental energy. They love to indulge in public gatherings. They easily get along with every person and make friends easily. They are often amoral about money. Travel brings good fortune and advancements in their life. Mercury is deemed strong if the date of birth is 5th, 14th or 23rd. Thursday Born : This day is ruled by Jupiter. People born on this day are individualistic and ambitious. They are rarely satisfied being subordinates. They are bold and strong, wise and inclined towards accumulation of knowledge. They pay due respect towards their parents, teachers and elders. Their jovial spirit makes them a very pleasing company. Jupiter is deemed strong if the date of birth is 3rd, 12th,21st, or 30th. Friday Born : This day is ruled by Venus. People born on this day love to wear white colour. They have a special attraction towards art, music, cinema and traveling. They have a magnetic charm. They often display motherly and spiritual love. Their romance involves exaltation of souls. They love to entertain friends and make guests happy and contended. They hate jealousy and marital discord. Venus is deemed strong if the birth date is 6th, 15th or 24th. Saturday Born : This day is ruled by Saturn. They are misinterpreted in every walk of life and feel lonely at heart. They are very diligent and self-disciplined. They carry out their cause irrespective of any opposition. They rise to greatness if they are ambitious. They serve people, especially the downtrodden. They face opposition without being much tensed about it. Their conception of god is linked with truth and deeds. Saturn is deemed strong if the birth date is 8th, 17th or 26th.